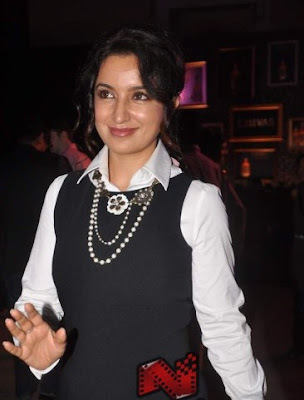 Vanilla Whiff...: Changing it up - Tisca Chopra at Chivas Studio Event. Changing it up - Tisca Chopra at Chivas Studio Event. Attempting to channel a bit of Parisian vibe a la CHANEL style was Tisca. Black sheath worn over cuffed and collared white shirt with pearls was a good try and a different take. Points for her for trying, I wish she had opted for a more natural hair and make up since simplicity is the key to achieve this look. Imagine pulled back, preppy hair and softer make up with elements of pink with the outfit. Labels: TISCA CHOPRA. INDIAN FASHION BLOG. In Vanessa Bruno - Kareena Kapoor. STUNNING IN WHITE! Andrea Riseborough. Shraddha Kapoor at 'Dirty Picture' screening. Sonam Kapoor at the Gucci Artisan Corner Event. One girl, two looks - Raageswari Loomba. Shilpa Shetty at the Pantene Event. Sonam Kapoor at 'Tom Cruise Bash', Mumbai. Kareena Kapoor at Top Gear Awards, 2011. In Giambattista Valli - Zoe Saldana. Emily Blunt at the Kennedy Centre Honors Gala. In Leger - Ramona Rodella & Camila Alves. Three looks - Angelina Jolie. Maternity Style - Lara Dutta. In a phase? Mallika Sherawat. Instant Love! Rooney Mara in Givenchy Couture. Floral Fun - Mini Mathur. In Gucci - Blake Lively. In colored Denims - Sonam Kapoor & Amrita Rao. Doing the Man Trend - Sandra Bullock. In Victoria Beckham - Sonam Kapoor. Androgynous Trend - Bhavna Sharma. Gone Bollywood - Arpita Khan. Jumpsuit Wars - Sarah Jane Dias & Twinkle Khanna. In Gucci - Hilary Swank. Kangna Ranaut at HT Mumabi's Most Stylish Awards! In Etro - Kareena Kapoor. In DKNY - Karishma Kapoor. Changing it up! Chitrangada Singh.